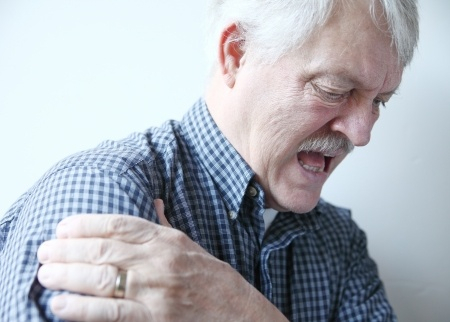 Torn Rotator Cuff Symptoms - Jeffrey H. Berg, M.D. I previously discussed the rotator cuff anatomy and the causes of rotator cuff tears. 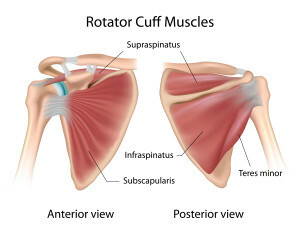 In this post, I will review the torn rotator cuff symptoms. Now let’s review the common torn rotator cuff symptoms. Many people who have a tear in their rotator cuff have no symptoms. In fact it is estimated that 50-60% of people over the age of 60 have a rotator cuff tear and no symptoms. These asymptomatic tears typically occur in older patients and with tears caused by slow wear rather than an acute injury. Pain. Often on the side of the upper arm or deep in the shoulder. Clicking or catching. Occurs with shoulder motion. The torn rotator cuff symptoms can be different for those with tears that develop slowly over time versus those who have tears that develop rapidly from trauma . Slow Symptom Onset. There is a very slow progression of symptoms over months or years. The symptoms in these people are often not as severe. They will frequently have pain with activity and while sleeping. Occasionally they will have clicking or catching. Often their strength can be normal or only mildly impaired. Rapid Symptom Onset. They may go years without symptoms, often not even aware that they have a tear. Suddenly significant pain and weakness can develop. The symptoms can begin either without any apparent cause or after an obvious injury. These people often have similar symptoms to those described below having an acute traumatic cause to their tear. Due to considerable weakness and pain, they usually will have poorly functioning shoulders and can be unable to even lift their arm. Constant pain that may even worsen at night is common. These tears occur in previously normal shoulders. They develop as a result of a traumatic injury. The symptoms usually become significant rather quickly, either at the time of the injury or shortly thereafter. There is often considerable pain and weakness. Attempts at raising the arm frequently increase the pain. Lowering the arm from a raised position can be even more painful, as is sleeping. Outward signs of bruising, swelling or deformity of the shoulder are rare and usually mean that there are other associated injuries. If you have any of these symptoms, an Orthopaedic Sports Medicine doctor can help. :-) Delay in treatment, can affect outcome. So if you suffer from these symptoms, it is a good idea to get your shoulder evaluated.